Electricians bring electricity into homes and businesses. They install and maintain the wiring, fuses, and other components through which electricity flows. 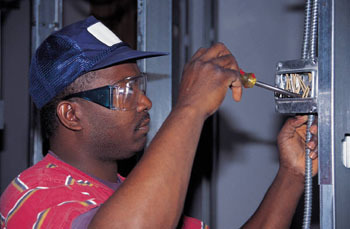 Electricians connect all types of wires to circuit breakers, transformers, and outlets. They join the wires in boxes with various specially designed connectors. When installing wiring, electricians use conduit benders, screwdrivers, pliers, knives, hacksaws, wire strippers, and power tools such as drills and saws. Formal training, an apprenticeship, and licensing is required to be an electrician. Job prospects are excellent for those with advanced skills and training and decent for those who are just entering the field. Electricians earn between $17 and $32 an hour on average. This entry was posted in Careers and Professions and tagged Electrical Technician, Electrician. Bookmark the permalink. Post a comment or leave a trackback: Trackback URL.